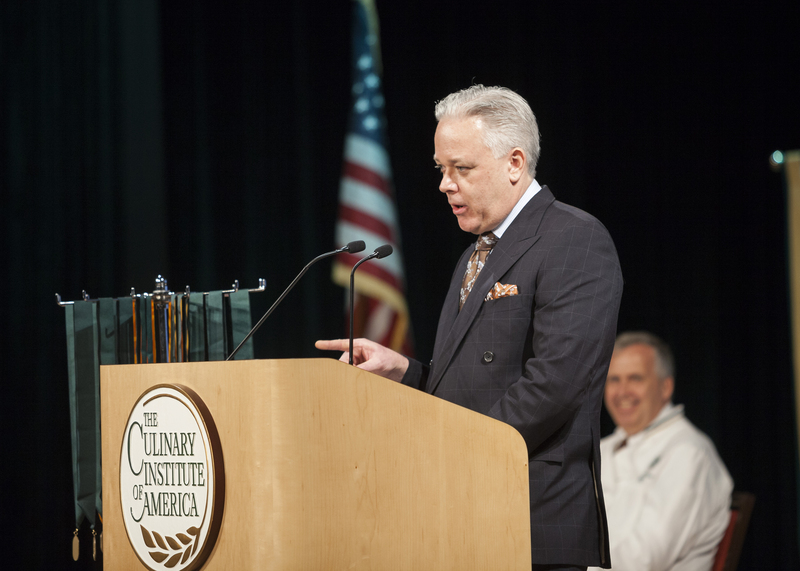 Hyde Park, NY – Chip Smith, executive chef and co-owner of The Simone in New York City, was the graduation speaker at the New York campus of The Culinary Institute of America on November 11. The Simone brings fine countryside French cuisine to Manhattan’s Upper East Side. The 1993 CIA alumnus addressed students graduating with degrees in culinary arts and baking and pastry arts. Chip Smith honed his skills working for big-name chefs such as Larry Forgione ’77, Jean-Louis Palladin, and Patrick O’Connell. Once he set out on his own, the accolades began streaming in. As chef and owner of Bonne Soirée in Chapel Hill, NC, he was a finalist for the James Beard Foundation Award as Best Chef: Southeast in 2008, 2009, and 2011 and his restaurant was named the best in the entire Raleigh, Durham, Chapel Hill “Triangle” by the News & Observer. The praise followed the South Carolina native to New York. In the three years The Simone has been open, it has earned a three-star review from The New York Times, been called a destination restaurant by Forbes, and a Top Food Destination by New York magazine.